Real Estate Valuation for Excel is for income property, commercial real estate, and all other types of real estate investment analysis. It is easy for beginning investors and agents to get started and has powerful, advanced features for commercial real estate developers, experienced investors, and agents. Create an investment analysis for each investor's share of ownership (without re-entering input data). All entity types supported. APOD - Creates an operating statement for the 1st year (cash flow). Conforms to Standard Real Estate Practices. Good investment analysis starting point. Benefits IPO - Creates in-depth 10-year financial analyzes, including Cash Flow, IRR, NPV, Cap Rate, GRM, opportunity cost, and much more. Color charts, graphs, detailed explanations. Glossary and Encyclopedia of commercial real estate terms. Appreciation Calculator - calculates past appreciation of subject and comparable properties. Amortization (Loan) Software - Makes schedule. Supports up to 30 balloon payments. SCF - Start up Cash Flow Software analyzes projected start up cash flow of newly constructed income properties. Note: The download version limits max Property Price input to $99,000 and allows 10 uses. If you want to go beyond these limits, please buy a Registered Version. Real Estate Valuation for Excel is designed by a team of commercial real estate developers and brokers with design input and evaluation from 6 CPA (Certified Public Accountant) firms, 2 commercial appraisal firms, and many commercial real estate investors and agents. The programmer and support manager is a former commercial real estate agent. 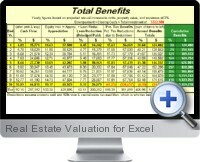 The Real Estate Valuation for Excel download also contains a free encyclopedia of Income Property and Commercial Real Estate terms, concepts, principles, practices, and calculations. It explains financial indicators (Cap Rate, IRR, Return, GRM, DCR, DSR, etc). It also explains real estate practices and accounting principles related to income property and commercial real estate. Furthermore, it explains how the Excel software addresses these issues. This free real estate investment encyclopedia is fully functional and may be used an unlimited number of times. It's part of the Benefits Workbook, which is included in the Real Estate investment analysis and valuation software suite. The encyclopedia part of the software never expires and keeps working forever. The encyclopedia is a permanent free resource for you, regardless of whether you buy registered version or not.